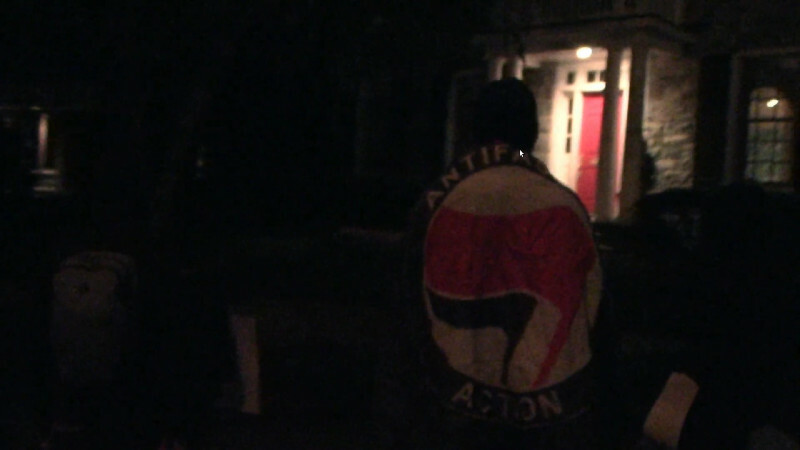 On the 7th of November, Tucker Carlson of both FOX News and the Daily Caller got an anti-Fascist home demo protesting his role in peddling Trump's racist hate. Trump's brand of hate as promoted by the far-right media is widely believed to be responsible for the recent wave of right-wing terror attacks in the US. Now, an HLS style home demo has served notice to Tucker Carlson, the Daily Caller, and FOX News that the consequences of peddling hate don't stop at the office, any more than the consequences of funding puppy-killing vivisectors do- "For the migrants we will fight, we know where you sleep at night!" Tucker Carlson is so bad he laughed about reports of pipe bombs sent to George Soros by the MAGAbomber. After laughing about bombs in the mail that can kill or maim postal workers as well as the intended targets, he now calls peaceful protests at his house "monstrous." What a crybaby! Backup post of same video to Liveleak in case the same MAGAts that got Twitter to suspend the SmashRacismDC account and remove that video get to Archive.org.